There’s really nothing like your best friend’s wedding, and there’s really no better cure for the post-dancing, post-gimlet, post-clown car ride home than brunch. Oh brunch, how I miss you. These days I don’t get too many brunch dates- work keeps getting in the way. But this Sunday I met up with some of my dearest friends for one of the most decadent morning meals I have ever had. My first trip to Sonsie on Newbury Street was ten years ago. Back then, it was the epitome of cool to my nerdlet self, and even though none of us college kids could afford to eat there, we could scrounge enough for a pre-party drink. Over the years Sonsie has remained a see and be seen place on Newbury, and I’ve long enjoyed their Bloody Marys. But only recently has their food become a reason to visit. A lunch this winter proved that their new mussels are fresh and aromatic, their staple mesclun and goat cheese salad still holds up, and their reinvented items- scallops and vegetable spring rolls, for example – are surprisingly fresh and refined. I haven’t been for dinner in years, but if this weekend’s brunch was any indication, dinner would be a meal to roll yourself home from. I chose the Baked Eggs for my meal. 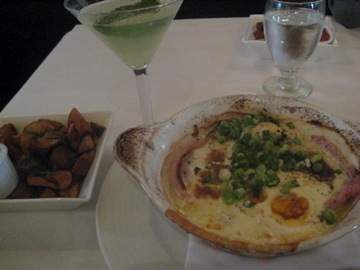 The server explained that these were whole eggs baked in a gratin dish, served with irish bacon. This was a fairly accurate description, save for the omission of about a cup of cream. The eggs and bacon had been baked with cheese and copious amounts of heavy cream, topped with more cheese and scallions. Oh, and a side dish of potatoes. After a few bites I decided I was only going to be able to eat half, but I managed to power through thanks to my brunch cocktail, the Golden Bloody Mary. One of four specialty Bloody Mary options, the “Golden” was described as basil vodka muddled with yellow tomatoes. 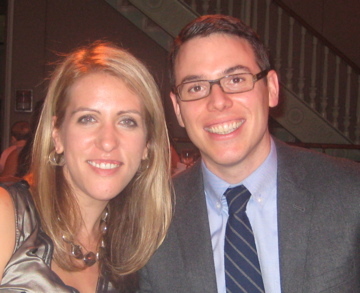 recipe for a happy marriage? 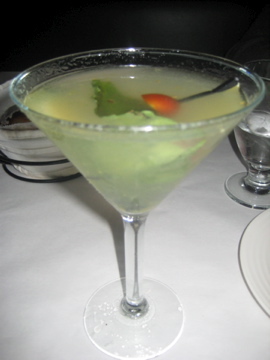 Not to disparage the drink, but it would be far more accurately described as a Basil Martini. And it was a good Basil Martini, it really was. It cut right through the richness of my fat-laden breakfast, which I appreciated. But this Bloody Mary left me wanting…a Bloody Mary. Next time I’ll go back to the original, or switch to a Salty Dog, as did one of my brunch companions.